Bats are so important to our very survival. That’s why we are the company that is so often chosen for humane Bat Removal in Virginia. The Virginia Big-eared Bat is of medium size (total length= 90-112 mm, and weight 9-12 grams) with huge ears joined across the forehead. They have elongated nostril openings, soft long fur, with the dorsal hairs dark, brown at the tip. Females gather from diverse hibernacula during April and May to form maternity colonies in warm caves. At rest, the ears are coiled slightly and lie along the neck. It is one of only two Virginia bat species which roost in caves in the summer. In the winter they commonly roost singly or in small groups. This is not a migratory bat, although, if disturbed, the entire colony may move to an alternate site. Lifespan is 16 years. These bats are designated as state and federally endangered mainly due to their small population and limited habitat and distribution. The Virginia Big-eared Bat is presently known to occur in three caves in Tazewell County during the summer, and five caves (Highland, Bland and Tazewell counties) in the winter. It is one of two Virginia bat species which roost in caves in the summer. They are found exclusively in limestone caves. There are also only three known maternity colonies. During hibernation, these bats need an environment that ranges from 32 to 54 degrees Fahrenheit. Virginia Big-Eared Bats store a certain amount of body fat in the winter during their hibernation, so when they are disturbed and the temperature of the cave changes, they must use up their body fat to raise the temperature of their bodies in order for them to leave the disturbed area. The burning of their fat makes them very weak and causes female bats to leave their babies if a maternity site is disturbed or altered. This is one of the main reasons why this subspecies of bats hibernate in tight clusters. These clusters occur at the opening of each cave, due to the suitable temperature and good ventilation. Maternity colonies are found in the warmer parts of the caves. The Virginia Big-eared Bat species subsists mostly on moths but also Neuroptera, Coleoptera, Mecoptera, Diptera and Hymenoptera. This bat feeds mostly over open pasture, corn and alfalfa fields, and around the crowns of trees. For fast, safe and humane Virginia Bat Removal contact us at (804) 729-0046 or toll-free at (888) 824-7383. 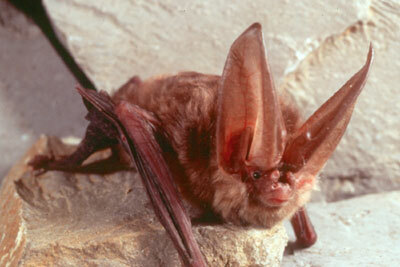 Call us for more questions on Virginia’s Big-eared bat.